Big, Bold, Beautiful Food: What Are You Making for Thanksgiving? My friend Tania is super organized. She's had her Thanksgiving menu planned for awhile. I've been super busy at work, but I can't really use that as an excuse. I always wait until the last minute. It's more exciting that way. Plus, I'm kind of craving-driven, so how do I know what I'll be craving days from now? But it's the weekend before Thanksgiving now, and I know I've got to start shopping and cooking for my larger family who starts arriving on Wednesday. We'll have 15 on Thanksgiving Day. That said, here's my thinking right now. Readers, what are you making or thinking about making? I'm likely to change my mind. Salad of blue cheese, candied walnuts, roasted beets, arugula & mixed greens with champagne vinaigrette. Whatever my brothers are bringing. Pork tenderloin with fresh herb crust (paste of rosemary, sage, thyme, salt, cayenne and olive oil since I will have these herbs on hand from the turkey) roasted on bed of sliced onions, a couple bay leaves and apple cider at 425 until brown and then 350 until at 149 degrees; sauce made from drippings with apples, dried cherries, and cognac. Oh, I'm definitely voting for the fennel and butternut squash soups! I'll be celebrating Thanksgiving late this year since I think I may actually be starting my job on Thursday (oh, the joys of moving overseas!). But on my table, I always have roasted or fried turkey, green beans of some sort, yeast rolls, sweet potato casserole, holiday mashed potato casserole, homemade cranberry sauce, and at least two desserts (pie is counted as one dessert with at least two types). Enjoy your Thanksgiving! Yay for cooking for cravings! 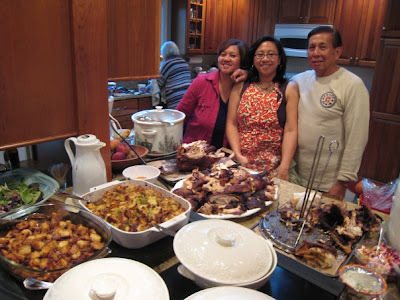 WE had our Thanksgiving already..Your menu is "beaucoup plus" elaborate than mine was.. I am certain it will be a wonderful event for you and yours..Happy Thanksgiving to you! We will be making Green Beans with Lemon Zest, Shallots, and Garlic---roasted in the oven after the turkey comes out. I just did a post on what to do with turkey leftovers...but with 15, you may not have to worry about that! You actually seem quite organized just going by your list!! I would go for the butternut squash and the fennel for soup (not sure what Italian Wedding soup is). Happy Thanksgiving - can't wait to see pics! You're just like me!! I like waiting to plan a festive menu at the last minute for the exact reason that I may change my mind and that its more exciting. You seem to have a very elaborate menu. Looks so fun.